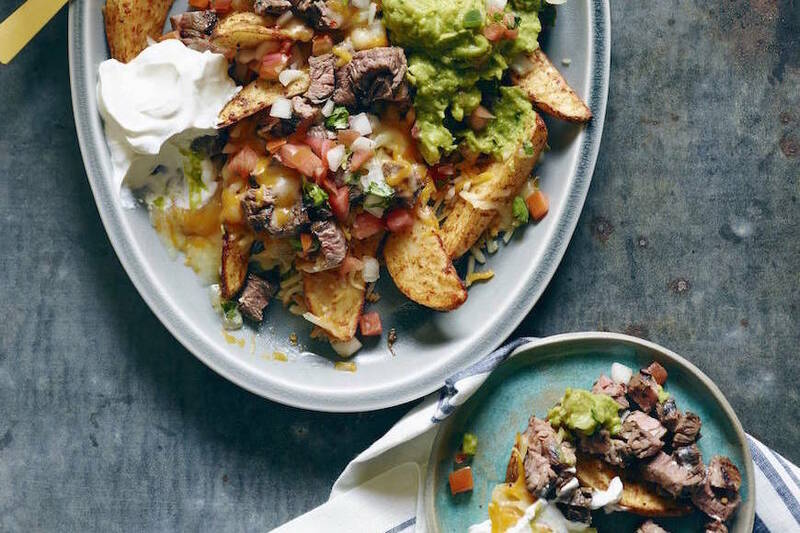 If you answered yes to all of the above… we are new-found best friends and you should totally come over for dinner this weekend and I’ll make us this. So here’s a quick story… every few weeks when the whole What’s Gaby Cooking team comes together for a photoshoot there is a LOT of food. We all taste / nibble on each recipe as it comes off the set and then divide it up and take it home. By the end of the day we are stuffed and locked and loaded with food for the entire week. But every once in a while a recipe comes along and everyone going NUTS over it. 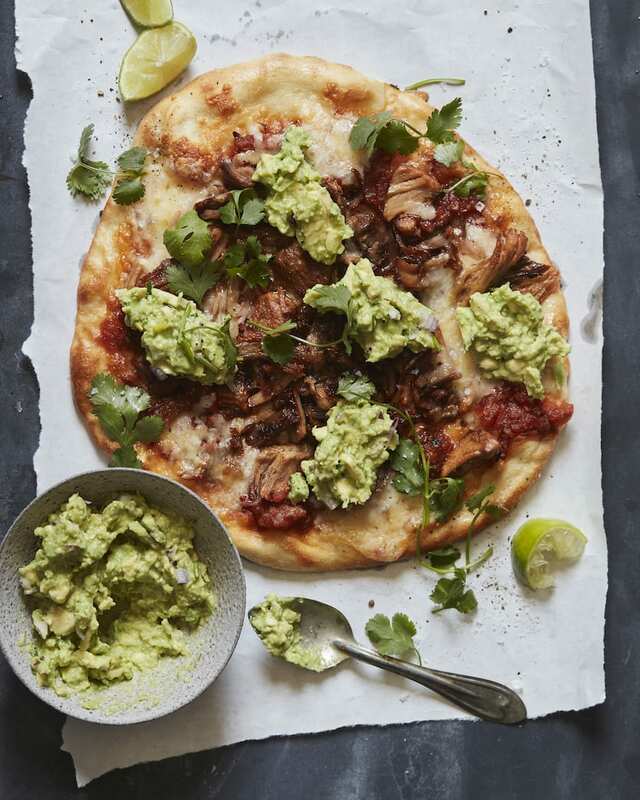 This Carnitas and Chipotle Guacamole Pizza is one of them. Normally we’d polish off a half pizza after shooting it, but this pizza was too good to let it go to leftovers and we all sat around a table and hosed it within minutes of shooting. The delicious carnitas with my favorite guacamole, tons of cheese and perfectly baked crust was exactly what everyone needed. And then we all proceeded to fall into a food coma 🙂 WORTH IT. Carnitas and Guacamole Pizza is a game changer. It’s true. Make it, eat it and you’ll be begging for more of this cheesy and guacamole filled creation. This is my go-to recipe for carnitas and you can whip up a batch of this and make it last for days. Or you can whip up a half batch and just make pizza. Either way, you’re going to fall in love. The key to the carnitas is freshly squeezed orange juice and your favorite salsa (obviously I use my own line of salsas). Have at it! In a large oven proof pan combine the cubed pork, stock, orange juice and salsa, this mixture should totally cover the pork, if not add a little water until the pork is submerged. Bring to a boil. Once boiling, reduce heat to medium low and simmer with the lid on for 3.5 hours, at which point the pork should be falling apart to the touch. Remove the lid and let the pork cook for about 20 minutes more until most of the liquid is evaporated. Remove the pan from the heat and shred the carnitas with 2 forks and set aside. Transfer the carnitas to a baking sheet and put into an oven on broil to crisp. (FOR THE INSTANT POT - do 1/4 cup orange juice and 1/2 cup salsa, no stock for 35 minutes in an instant pot. Then let de-pressurize for 20 minutes before opening. Combine everything in a large bowl and mash together until half smooth and half chunky. Cover with plastic wrap and set aside. Preheat the oven to 475 degrees F. Roll the pizza dough out on. Spread the salsa on the pizza dough in place of pizza sauce. Top the salsa with the shredded cheese and transfer to the preheated oven for about 8 minutes. Remove the baking sheet from the oven and sprinkle on the cooked and shredded carnitas. Transfer the baking sheet back into the oven for 5 minutes more until the cheese is golden and the crust is fully cooked. Remove the baking sheet from the oven and let it rest for a few minutes. Top with guacamole and cilantro serve immediately. Mercy! That looks like a pizzas best dream! I would love to come over this weekend!! Love this pizza ~ especially with all that extra protein on top! Guacamole just makes everything better! My son saw a picture of a taco pizza in a magazine and fell in love. 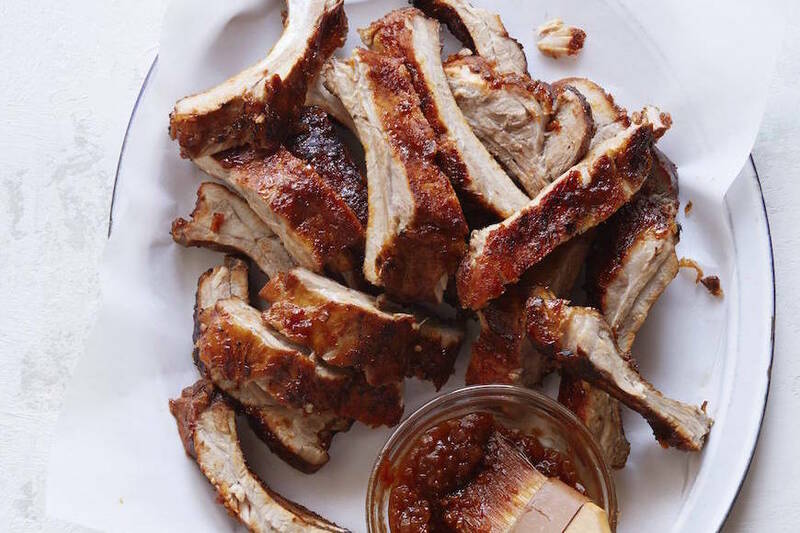 I am making it tonight but would love to make carnitas to put on top. Habanero laced cheese sounds enticing! You are a very thoughtful fiance! Seriously?! This looks amazing! Eating guac on pizza….YES!!! 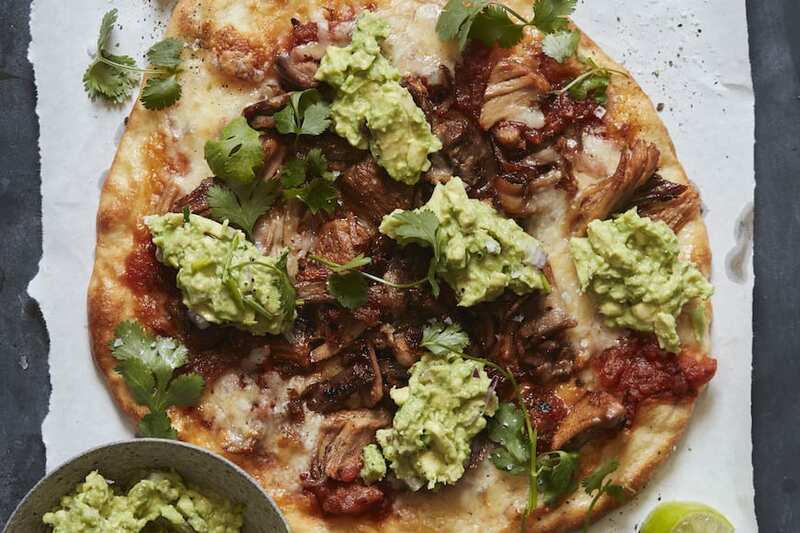 you are a big carnitas lover, and a true SoCal girl 🙂 This pizza is SO delicious looking, and you are so sweet for cooking up a storm for your fiance. He is one lucky dude! 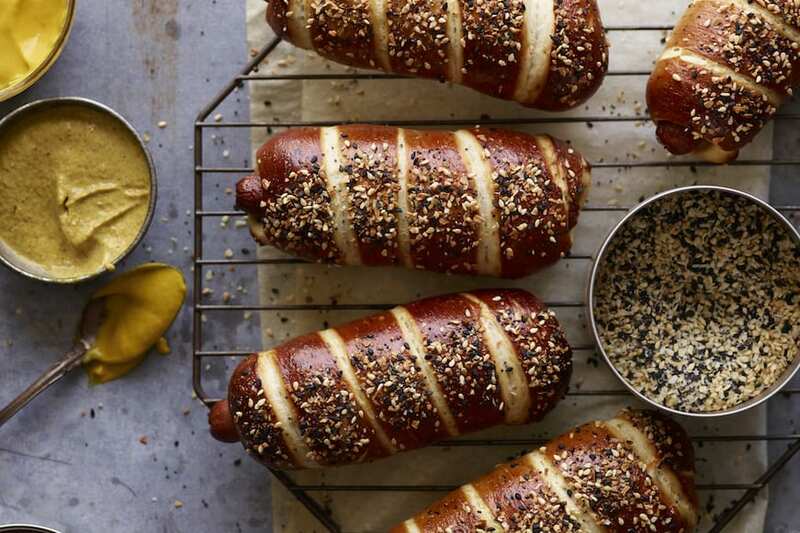 This would make such good party food! Nice one, G! Uh, what the hell did you just do to me???? I was just saying that I didn’t have much to look forward to this weekend…uh, but yah…this changes everythings!! Thanks for leaving us all a meal before your big trip. Have fun!! Yikes! That looks, well, yeah…. This looks great and so fresh for summer! Love your take and use of ingredients! Are you kidding me!!!!???? SO GOOD! My favorite taco turned into a pizza = genius! Definitely love carnitas, guac, AND pizza! Natural release on the Instant Pot? Guacamole on pizza is the BEST! can you make the carnitas in a slow cooker / croc pot? 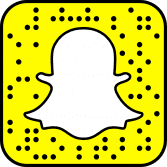 On step 1 you say add “stock” – how much? It’s not in the ingredients. Thanks! And the spices and lime, is that added in step 1 too? I made this tonight with store bought pre-cooked and shredded pork (thank you, Trader Joe’s) and it was so good and super easy! I also served it with Sriracha sauce and sour cream. Oh man…so yummy. I’ll be adding this to my monthly rotation. Thanks SO much for this!